Texas advanced to the second round of the NCAA Tournament behind a barrage of 3-pointers from senior guard [tag]AJ Abrams[/tag] and support from [tag]Dexter Pittman[/tag] and others. They started slow but a run of four straight 3’s by Abrams allowed the Horns to pull away from [tag]Minnesota[/tag] and eventually win 76-62. Texas will play [tag]Duke[/tag] on Saturday at 7:15pm. ESPN’s Andy Katz spends a few minutes breaking down the Horns’ first round matchup with [tag]Minnesota[/tag]. He talks (very) briefly with both head coaches to get their thoughts on the tournament and their first round opponent. Texas opens the NCAA Tournament Thursday at 6:10pm. The Texas Longhorns men’s basketball team finished the season with a win over [tag]Baylor[/tag] and a second half meltdown loss against [tag]Kansas[/tag]. 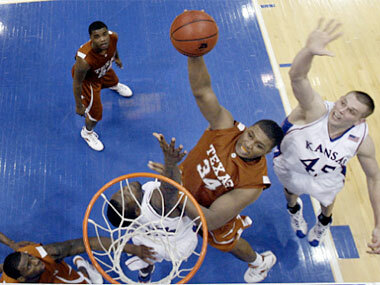 Texas finished the 2009 regular season 20-10 (9-7 in conference), good enough for fifth place in the Big 12. Rick Barnes’ squad will take on [tag]Colorado[/tag] Wednesday in the Big 12 tournament. Most experts feel UT locked up a March Madness berth by beating Baylor and earning their 20th win of the season. Texas holds wins over UCLA, Villanova, Wisconsin, and [tag]Oklahoma[/tag]. Out of Texas’ 10 losses only the ones to Arkansas (who also beat Oklahoma), Nebraska, and Kansas State can be considered “bad” losses. Texas may not need to win Wednesday over the Buffaloes to make the dance, but a loss would most likely result in an 8/9 seed. Beggars can’t be choosers, and right now the Longhorns probably just want to get to the tournament and see what happens, but an 8/9 seed would set up a potential second round matchup with the number one seed of their bracket. That is assuming the Horns get past their first round opponent, which is no given this year. If Texas can make a nice run in the tournament they have a chance to creep up to a 6 seed. Texas would likely need to beat Colorado, beat Kansas State in the second round then have a good showing in the semifinals. A 6 seed would set up a matchup with a 10 seed and set up a second round matchup with a team ranked no better than a three seed in their bracket. Texas has the ability to play with any team in the country. 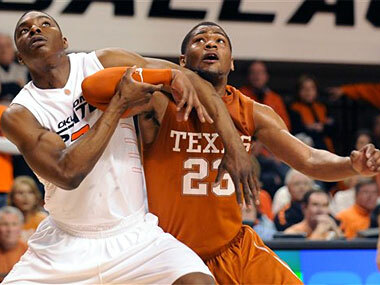 In the first half against Kansas on Saturday the Longhorns proved that. When [tag]Damion James[/tag] is attacking the basket and making jump shots, and new point guard [tag]Dogus Balbay[/tag] is getting into the lane Texas is very dangerous. The problem is this team has had a very hard time sustaining a team effort for 40 minutes. The Longhorns fell apart offensively down the stretch against Kansas and the defense couldn’t hold up to the pressure. If teams keep Balbay out of the lane and James and even [tag]Gary Johnson[/tag] stop hitting their mid-range jump shots teams are able to focus all of their defensive energy on taking away sharp shooting [tag]AJ Abrams[/tag] and clogging the lane. Kansas moved into a form of box and one to take away Abrams and completely shut down the lane and Texas had no answer. The Longhorns have been prone to long droughts between points and against the type of teams they will face in the national tournament teams can’t afford to do that. Anything can happen in March, which has been proven year after year. Texas does have a few of the ingredients needed for an unlikely tournament run. They play great defense, they have a deep front court, and they have a guy who can make four or five three pointers in a row. March Madness is a guard dominated tournament. And that is where the problem lies for this year’s Longhorns. Texas has a guard who can shoot. Texas has a guard that can defend. Texas even has a guard who can break down a defense off the dribble and get to the bucket. Unfortunately they need three different small guards on the court to have all of them on the floor at the same time. Texas has their work cut out for them, and they enter this post season in a different role than they’re used to the past few years. It will be interesting to see how the team reacts. There is no doubt Rick Barnes can recruit with the best coaches in the nation. Now it is time to prove he can elevate a team to achieve more than their talent should suggest. The Longhorns big win over the Sooners mirrored their 2008-09 basketball season, with huge swings between good play followed by long stretches of mediocrity and frustration. Fortunately, Saturday night senior guard [tag]AJ Abrams[/tag] took his teammates on his back during the second half with 16 straight points and the Horns were able to pull out a very important win over their biggest rival. Next up for Abrams and the Horns is another important conference match-up against [tag]Texas Tech[/tag] Wednesday.